An early study indicates that the humble tumbleweed (the Russian thistle) may be able to help humans round up depleted uranium (DU) from contaminated soil - both at weapon testing grounds and on battlefields. In the study, various plants were tested for their ability to pick up DU from soil in semi-arid climates. Some plants that did well (like Indian mustard) also required a significant effort for cultivation. 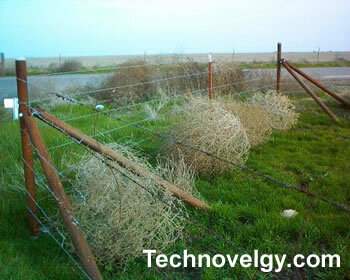 Tumbleweeds do not require cultivation, use very little water, and spread themselves by detaching from roots and then tumbling along in the wind to a new location. In looking for plants to help, researchers are following in the footsteps of old-fashioned uranium prospectors, who would use Geiger counters on junipers to find uranium deposits. Depleted uranium is uranium which contains reduced quantities of the fissile isotope U-235 and the radioactive isotope U-234. Depleted uranium is not completely free of radioactive isotopes; it must still be handled carefully. As a heavy metal (like lead) it is toxic; studies suggest that inhaling dust from DU-based weapons can be harmful. The military makes use of DU because its high density (70% more dense than lead) makes it an excellent choice for an anti-tank weapon. It is also pyrophoric; the heat build-up caused by penetration of metal armor causes the depleted uranium to disintegrate and combust when it reaches air (in the interior of an enemy tank or other vehicle). The Department of Energy has an inventory of almost half a million tons of depleted uranium as a result of efforts to create enriched uranium (depleted uranium is a waste product). In his 1983 novel Against Infinity, science fiction author Gregory Benford wrote about bioengineered organisms called "scooters" that were designed to roam the surface of Ganymede (one of the moons of Jupiter) and find ammonia-based compounds and digest them into usable oxygen compounds.